At precisely 4:07 p.m., the clouds seemed as dark as a B flat piano key, the wind seemed as fierce as a grasslands predator mid-pounce, and my prospects seemed as dim as a fluorescent light bulb just turned on. But I got brighter, carried in the arms of the vigorous American folk dance, prevalent on the Eastern seaboard, known as “contra dance.” (Look it up.) The exhilarating yet familiar throb of each move hitting my body–swing with your neighbor on the side, pull by through the blisters, dosido while spinning like a tornado, arms twisting wildly–was neon against the dull premise of the day. Faces swirled across my vision in a swarm, up and down the set and back, towards the cathartic band blasting from the top of the hall, and slowly they blurred into one huge smiling presence, there to catch me after the craziest of flourishes. The author and her parents have attended CDSS’s family program at Timber Ridge Camp in High View, WV for the last 8 years (since Chloe was 6); they are members of Country Dance New York and live in Brooklyn. The above is from Chloe’s blog, “Improbability in the City,” http://myimprobability.blogspot.com, posted 9/21/13. This entry was posted in American Dance, Camps & Programs, Features & Fun, Guest Posts, Traditional Dance, Youth on October 30, 2013 by Lynn Nichols. 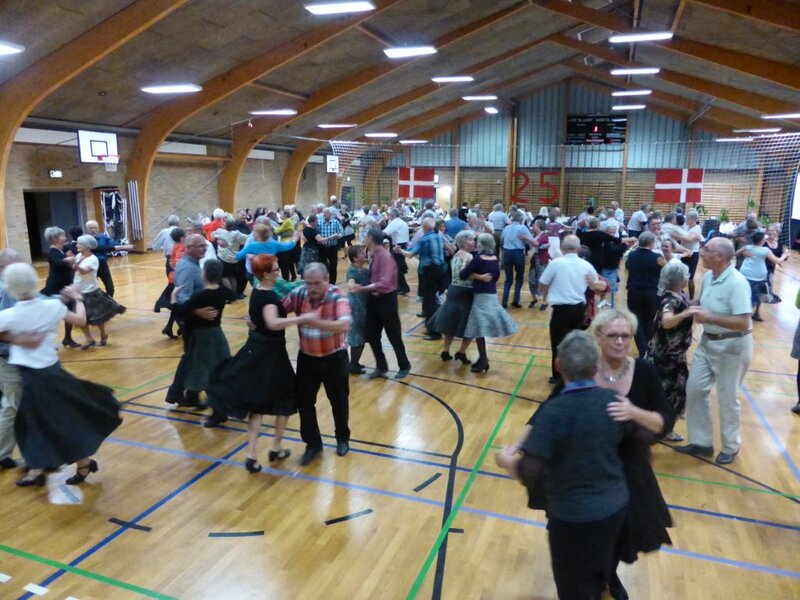 Recently, CDSS sent a Certificate of Appreciation to recognize the Vissenbjerg Country Dancers as they reached their 25th Anniversary of Calling and Dancing. We received the following note and we picked out a couple of pictures to share. Thank you so much for The Certificate of Appreciation that Erik Lilholt brought us to our 25th Anniversary of Calling and Dancing. We are very honored and pleased that it is given to the Vissenbjerg Country Dancers. 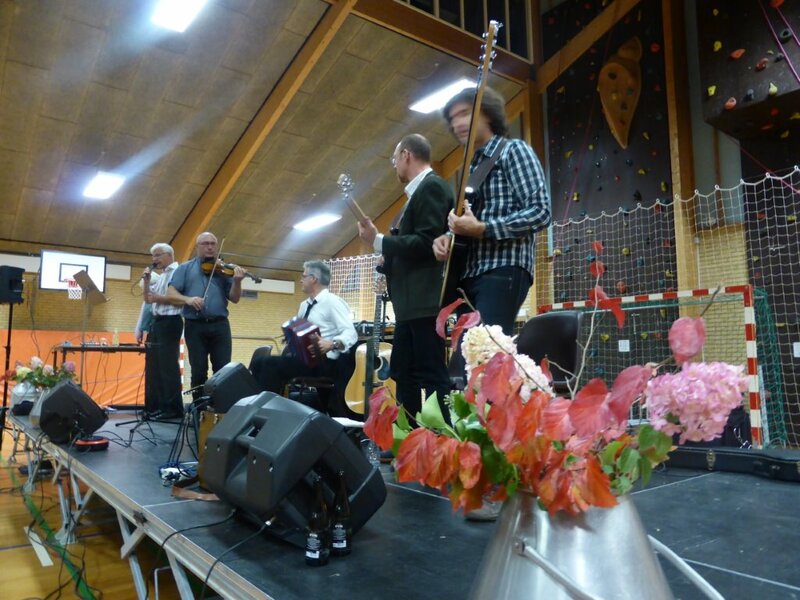 We had a wonderful evening. 134 dancers, 4 musicians and us. Good food, good humor, good music, everybody happy, also the 4 newcomers we got this year. Nine callers to get us through the evening. This entry was posted in Features & Fun on October 23, 2013 by Lynn Nichols. 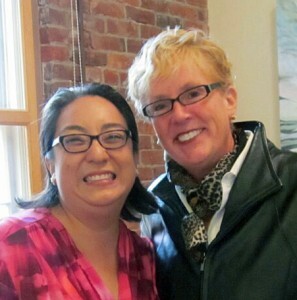 DART is coming to Amherst, MA, this weekend! Inspired by the Dancing England Rapper Tournament (DERT), the Dancing America Rapper Tournament (DART) is a weekend-long opportunity for rapper teams to compete, show off, and learn from each other. Judges, stationed in pubs, award ranks, prizes, and constructive critiques based on teams’ performances. We are very excited to have this tournament in our area…check out the DART website for more information. And visit their Facebook page. We wish all the teams participating — Flesh Wound, Northampton, MA (Host team); A Sworded Affair, Burlington, VT; Half Moon Sword, New York City, NY; Charles River Rapper, greater Boston, MA; Candyrapper, Sudbury, MA; Charm City Rapper, Baltimore, MD; Bubble Rapper, Carlisle, MA; Pocket Flyers, Sudbury, MA; Rust Belt, Oberlin, OH; No Apologies, Boston area, MA — the best of luck! This entry was posted in Display Dance, Features & Fun, Morris Dance on October 23, 2013 by Lynn Nichols. 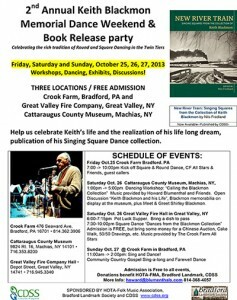 I am excited to share that I will be attending the 2nd Annual Keith Blackmon Memorial Dance Weekend and Book Release Party this Saturday, Oct. 25th, in Pennsylvania. Click on the flyer on the right to download a PDF version. I look forward to a fun evening of dance and song! Hope to see some of you there. This entry was posted in Features & Fun on October 21, 2013 by Lynn Nichols. This past Friday, Pat McPherson, Director of the CDSS Education Department, and I provided testimony to the Massachusetts Joint Committee on Tourism, Arts and Cultural Development. State Representative Cory Atkins (D-Concord) and Senator Kathleen O’Connor Ives (D-Newburyport), Co-Chairs of the Joint Committee, are traveling around the state with fellow committee members to solicit ideas from the arts, cultural and tourism communities, and the general public, to help the Committee develop policies that strengthen arts, culture and tourism in Massachusetts. Tourism is recognized as the third largest revenue producing industry in Massachusetts with a $3.6 billion payroll across 124,700 jobs. In 2011, 21.3 million people visited the state and spent $16.9 billion, according to the Massachusetts Office of Travel and Tourism. Tourist surveys consistently indicate that arts, culture and history are among the top reasons for choosing to visit our state. Nonprofit cultural organizations employ nearly 18,000 Massachusetts residents, generating $28 million in payroll taxes and $1.2 billion in annual in-state spending. Our primary goal of providing testimony was to raise the visibility of traditional dance, music and song in Massachusetts and showcase the good work of the Country Dance and Song Society over the past 98 years. “I look forward to visiting different parts of the state and working with the Regional Tourist Councils to promote these areas and the attractions that they offer in an effort to encourage economic growth throughout the Commonwealth,” said Senator Kathleen O’Connor Ives. 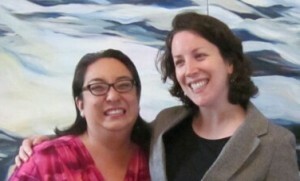 Senator O’Connor Ives and I shared a fun moment as fellow alums of Mt. Holyoke College. Rep. Andrews, a member of the committee, came up to ask advice from CDSS on thoughts and resources for bringing dance to a community in her district and engaging children and their families in participatory dance. Also in attendance were Linda Henry, CDSS Outreach & Grants Manager; Lynn Nichols, CDSS Webmaster; and CDSS member Alex Krogh-Grabbe of Amherst. CDSS is working on creating toolkits to provide to members with best practices to engage local elected leaders to increase the visibility of traditional dance, music and song, and provide testimony on the value of our participatory arts in our communities. We thank the Massachusetts Cultural Council for their on-going support of our work and thanks to the Joint Committee on Tourism, Arts and Cultural Development for their time visiting towns around Massachusetts. This entry was posted in American Dance, Arts & Tourism, Arts Advocacy, Dance Callers, English Dance, Features & Fun, Ideas & Resources, Morris Dance, Musicians, Traditional Dance, Updates from the Office on October 7, 2013 by Lynn Nichols.